Apollonius of Rhodes, also known as Apollonius Rhodius (early third century B.C.E. - after 246 B.C.E. ), was an epic poet, scholar, and director of the Library of Alexandria. He is best known for his epic poem, the Argonautica, which told of the mythological story of Jason and the Argonauts' quest for the Golden Fleece and is one of the chief works in the history of epic poetry. Like Homer's Iliad and Odyssey, Argonautica was written in hexameters and is comparable to these epic poems. Often, Apollonius paraphrases Homer, who was very popular at the court of the Ptolemaic rulers, Ptolemy IV Philopator and Arsinoe III. 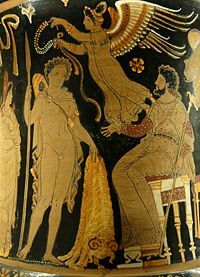 There is a major difference between Apollonius' heroes and those of Homer, however: Apollonius' heroes and heroines are, from a psychological point of view, more complex and credible. Apollonius's poem inspired the Roman Valerius Flaccus' Argonautica. The sources dealing with Apollonius's life are sketchy and often contradictory. It is clear, however, Apollonius was not born in Rhodes, but adopted the surname "Rhodius" while living there. He was born in either Alexandria or Naucratis, which lay south of Alexandria on the Nile. He lived for a time in Rhodes, and he held the post of Librarian at least until 246 B.C.E. He was a student of the poet and scholar Callimachus, and there are also accounts of a later, bitter feud between the student and his mentor. There are four main sources of information on Apollonius' life: Two texts entitled, Life of Apollonius; an entry on him in the tenth century encyclopedia, the Suda; and a second century B.C.E. papyrus, P.Oxy. 1241, which provides the names of several heads of the Library of Alexandria. Other miscellaneous texts provide further information. Birth: The two Lives and the Suda name Apollonius' father as Silleus or Illeus. The second Life names his mother as "Rhode," meaning "Rhodian woman," but this may merely be an attempt to explain Apollonius' epithet "Rhodian." The Lives, the Suda, and the historian Strabo all agree that Apollonius came from Alexandria; Athenaeus and Aelian, however, say that he came from Naucratis, some 43.5 miles south of Alexandria along the river Nile. No source gives the date of his birth. Student of Callimachus: The Lives and the Suda agree that Apollonius was a student of the poet and scholar Callimachus. The second Life adds that "some say" Apollonius was buried with Callimachus. 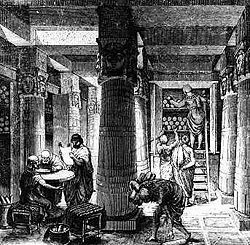 Head of the Library of Alexandria: The second Life, the Suda< and P.Oxy. 1241 attest that Apollonius held this post. P. Oxy. 1241 establishes that Apollonius was succeeded by Eratosthenes; this must have been after 247/246 B.C.E., the date of the accession of Ptolemy III Euergetes, who seems to be the monarch that appointed Eratosthenes. The Suda says that Apollonius succeeded Eratosthenes, but this is impossible: Apollonius studied with Callimachus, who died ca. 240 B.C.E. ; the first Life says Apollonius was contemporary with Ptolemy III; and Eratosthenes held the post until at least 204 B.C.E. The Suda entry on Eratosthenes says that Eratosthenes held the post from the reign of Ptolemy III Euergetes until Ptolemy V.
Move from Alexandria to Rhodes: The Lives and the Suda attest to Apollonius moving from Alexandria to Rhodes. It is uncertain, however, whether he died there, or whether he came back to Alexandria in order to take up the position of head of the Library after his time in Rhodes. Death: Only the two Lives give information about Apollonius' death, and they disagree. The first says he died in Rhodes; the second says he died after returning to Alexandria. From this, one can conclude that (1) Apollonius was born in either Alexandria or Naucratis; (2) he lived for a time in Rhodes; (3) he held the post of Librarian at least until 246 B.C.E. From this, in turn, one may infer that he lived in the early-to-mid third century B.C.E. Beyond this point lies only speculation. A number of sources speak of a bitter feud between Apollonius and his former teacher, Callimachus. The Palatine Anthology preserves an epigram, attributed to "Apollonius the grammarian," which mocks Callimachus and his most famous poem, the Aetia (Causes): "Callimachus: Trash, cheat, wood-for-brains." In addition, multiple sources explain Callimachus' poem, Ibis— which has not survived—as a polemic against an enemy identified as Apollonius. Between them, these references conjure up images of a sensational literary feud between the two figures. However, the truth of this story continues to be debated in modern scholarship, with views on both sides. Both of the Lives of Apollonius stress the friendship between the poets; the second Life even claims they were buried together; and some scholars doubt the sources that identify the Ibis as a polemic against Apollonius. There is still not a consensus, but most scholars of Hellenistic literature now believe the feud was enormously sensationalized, if it happened at all. A second sensationalized story about Apollonius is the account in the Lives of how, as a young man, he gave a performance of his epic, the Argonautica, in Alexandria. He was universally mocked for it, and fled to Rhodes in shame. There, he was feted by the Rhodians and given citizenship. After this, according to the second Life, he made a triumphant return to Alexandria, where he was promptly elevated to head of the Library. It is unlikely that much of this is factual; the story is a mixture of "local boy makes good" and "underdog makes a heroic comeback." Fairytale elements such as these are characteristic of ancient biographies. 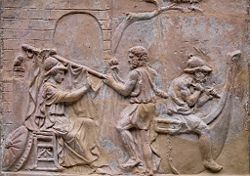 Athena (left) helps build the ship Argo; Roman molded terracotta plaque, first century C.E. The Argonautica differs in some respects from traditional or Homeric Greek epic, though Apollonius certainly used Homer as a model. For one thing, the Argonautica is shorter than Homer’s epics, with four books totaling less than 6,000 lines, while the Iliad runs to more than 16,000 lines. Apollonius may have been influenced here by Callimachus’ brevity, or by Aristotle’s recommendation that poems be "on a smaller scale than the old epics, and answering in length to the group of tragedies presented at a single sitting" (the Poetics). Apollonius' epic also differs from the more traditional epic in its very human protagonist, Jason. Both this hero and others appear more three-dimensional and psychologically credible in Apollonius' work. Argonautica also gives many accounts of the origins of local customs (aetiology) and other popular subjects of Hellenistic poetry. Apollonius also chooses the less-shocking versions of some myths, having Medea, for example, merely watch the murder of Apsyrtus instead of murdering him herself. The gods are relatively distant and inactive throughout much of the epic, following the Hellenistic trend to allegorize and rationalize religion. Heterosexual loves such as Jason's are emphasized more than homosexual loves, such as that of Heracles and Hylas, another trend in Hellenistic literature. Many critics regard the love of Medea and Jason in the third book as the best written and most memorable episode. Opinions on Apollonius' lasting contribution to Western literature, the Argonautica, have changed over time. Some critics in antiquity considered it mediocre. Recent criticism has seen a renaissance of interest in the poem and an awareness of its qualities, with numerous scholarly studies published regularly. Its influence on later poets, like Virgil, is now well recognized, and any account of the history of epic poetry now routinely includes substantial attention to Apollonius. ↑ Athenaeus, Deipnosophistae 7.19. Retrieved October 5, 2007. ↑ D.P. Nelis 1999, review of P. Green 1997, Apollonius: the Argonautica (Berkeley), in Journal of Hellenic Studies 119: 187. ↑ Pseudo-Longinus, On the Sublime. Retrieved December 20, 2007. Works by Apollonius of Rhodes. Project Gutenberg www.gutenberg.org. History of "Apollonius of Rhodes"
This page was last modified on 8 April 2016, at 18:52.